I can say that I have personal experience with this product and my children absolutely LOVE it. They look forward to getting their monthly packages with a new country for my son and two new states for my daughter. My daughter, who is in 2nd grade, has learned so much about the different states including their state animals, birds, interesting facts about each one, and will often put on a “show” to tell all her new facts about her new states. Little Passports has been one of the best educational investments I have ever made for my children. Did you know that Little Passports was co-founded by two moms who believe in raising our children to be compassionate and knowledgeable on world cultures and people? Pretty sweet business philosophy! I can say that I have personal experience with this product and my children absolutely LOVE it. They look forward to getting their monthly packages with a new country for my son and two new states for my daughter. My daughter, who is in 2nd grade, has learned so much about the different states including their state animals, birds, interesting facts about each one, and will often put on a “show” to tell all her new facts about her new states. Little Passports has been one of the best educational investments I have ever made for my children. Each month, the imaginary characters of Little Passports, named Sam and Sofia, travel the globe on their magic scooter and share their experiences with your child. 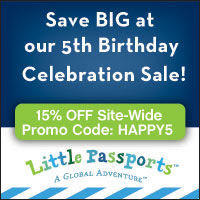 This birthday sale, which allows you to take 15% off your total subscription package, will give your child a personalized package in the mail that includes an adventure letter, fun souvenirs, activities and access to their online Boarding Zone full of activities and games. (with that sort of deal, I feel like it’s my birthday!) Click on the link or banner below to sign up for your subscription today and get 15% off by using the code: HAPPY5 from today through Tuesday, 4/8.